Ever listen to our long-running morning radio show? We'd love to have you join us! 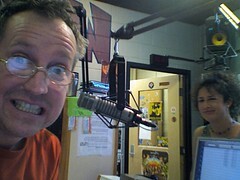 It's Trivial Thursdays on WRFL-FM in Lexington, KY! We're on from 7-9am every Thursday, and you can even listen online anywhere on earth! This is the story of keeping coffee warm. It is a story with many twists and turns, but we shall strive to simplify, simplify. The story begins years ago with a fabulous device sold at Toddy Coffee. I bought one because Jenny Toomey said it was great, and I think Jenny's great and so her coffee must be, too. And wow, was that an understatement! I mean, just take a look at the specs. I don't know what the easiest thing is to call this coffee that has so completely engrained itself into the Campsie Lifestyle; I guess "cold-brew" is the most accurate term. Lucy and I enjoy this coffee nearly every single day of our lives. It's that good. The only issue (and there is always an only issue, right?) is keeping it warm. First there was the thermos, a vintage Aladdin just like this one. But that seemed somehow clunky and inelegant, although it was effective, heat-wise. Next, was the Ebay foray into acquiring a beautiful vintage West Bend Thermo-Serv, which was elegant and cool, but didn't keep the coffee warm enough long enough. Curses! Now, friends, we come to the salvation. 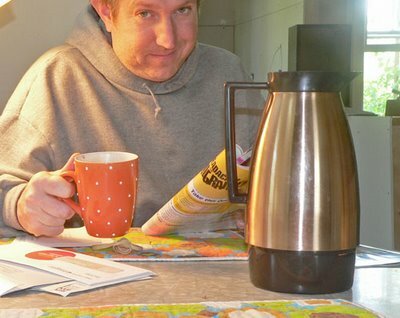 While recently dining at Perkin's Family Restaurant, former employer of my daughter, Lucy and I both fixed our eyes on the wonder of their table-top coffee pitchers. They were vintage. They were institutional. They kept the coffee pipin' hot! I had to have one. I asked our server if I could buy it. She laughed. They were not for sale. She said "no." And then she laughed some more. Not to be deterred—hell, I could always steal one, right?—I took it to the counter when we left and sat it down with my bill and asked the cashier if I could buy it. She, too, said "no," but she didn't laugh. In fact, when I pressed the point, she kind of snarled. So I stepped back. As we were leaving, darling daughter Lauren visits with some former co-workers and comes out to tell me that Jackie, the manager said that I could have one, if I'd just call next week when he was scheduled to order some new ones. JOY! I dutifully telephoned on the appointed day and missed him. Called back the next day and he said "call back next week." And thus began a fairly complicated game of phone tag. I wondered whether or not this was going to pan out. I had to have that coffee server. It was going to change everything. And now I've got it. Today, I called and Jackie said to come on out. Today, I'm kind of busy, so I said 'how's tomorrow for you?" Jackie said: "Oh, tomorrow I'm going to Florida for a week." Fine. No problem. I'll be there in…in…hell, I'm coming right over."